We have 24 consoles coming in soon and will be very short of room so I have reduced some prices to move our stock and make some room including knocking £300 off this console to move it on, it is a great little console at a very low price. HILL AUDIO 28 x 16 Recording Mixer. 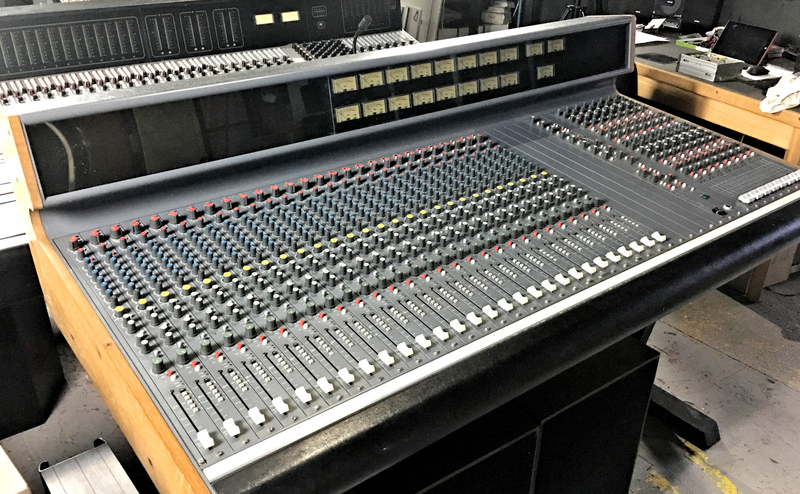 Hill Audio are a UK company based in Essex and are mainly concerned with PA equipment, in the 1970's & 80's they manufactured some equipment for recording studios and this console is one of those items. This console is fully modular and has been serviced for us by Chris Roberts it is now in good electronic condition and as you can see it is in good cosmetic condition too, it is ready to install. It is easy to service and maintain as there are no redundant components in the console. The console has 26 input channels and 16 groups plus mix out, there are direct outputs from the channels as well as the 16 group outputs with inserts on the channels and groups. Although it is a standard British split mode desk it has In Line facilities, the tape return can be sent to the monitor or channel enabling quick and easy summing with no re-patching required.It comes with an external power supply and a console stand. The EQ consists of 6 fixed bands plus 1 swept band, the 6 bands have 12 db of boost and cut at the following frequencies 60 Hz - 150 Hz - 500 Hz - 1.5 kHz - 4.5 kHz & 12.5 kHz The swept band covers the frequencies 50 Hz to 5 kHz providing up to 24 db cut or up to 6 db of boost. The group/tape monitor also has basic shelving EQ at 100 Hz & 10 kHz. There are 4 aux sends to 8 aux buses on the channels, the monitors can send to the first 4 aux buses via 2 sends. There are inserts on all channels and groups. This mixer has some nice features on it, the mix can be sent to 3 machines are different levels, it can supply the control room mix to 3 sets of as well as to the studio. the master module has an Oscillator and headphone outputs, the groups can also be sent to the mix bus as well as the monitors, total 58 line inputs.